I have been thinking about Robert Bly's book Iron John: A Book About Men, now that I am teaching British literature again. This has led me to another book, one that I haven't in my hand yet, but one I've that seems provocative, Hammering Hot Iron: A Spiritual Critique of Bly's Iron John. 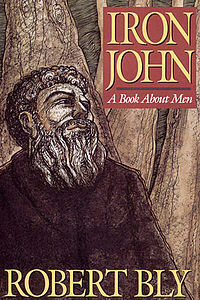 Poet Robert Bly's Iron John in the preface says that "the images of adult manhood given by the popular culture are worn out" and then provides new interpretations of what it means to be a man, "new visions of what a man is or could be." Certainly we need to go beyond the stereotype of a man as one who stifles feeling and uses violence and death as the # 1 go-to for solving conflict. In Bly's preface to Iron John, Bly states: "There is male initiation, female initiation, and human initiation. In this book I am talking about male initiation only." He continues by saying that the book is not a reaction against the women's movement but rather an addition to the movement of men to understand themselves, each exploration moving "on a separate timetable." 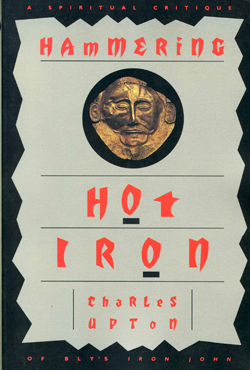 Charles Upton, another poet, wrote Hammering Iron John in an attempt to extend the vision of what it means to be a man as more importantly a quest to discover what it means to be human. J. Gomez, Amazon reviewer writes the following: "Upton writes: '. . . Bly states that his intention is to talk about male initiation alone. My intention is to try and situate this initiation in its greater context, that of the attainment of the fully human state.'" From reading passages with the "Look Inside" function at Amazon, it appears that Upton's prose style is denser and more rambling than Bly's. However, his ideas do indeed stimulate thought, enriching the reading of Bly's Iron John. He mentions that one attempt by men to embrace their greater selves was to embrace the concept of the earth mother, but to embrace the All-Mother through loving the earth through the senses, what men ended up with "was a goddess too big to marry and too indifferent and impersonal to act as the protective mother we hoped she would be for us, the nurturing bosom that would shield us against the negative father-world of raw technological society." Robert Bly is certainly aware of transcendence as a mean of finding our humanity, our connection with the universe, and therefore our "maleness" or "femaleness." 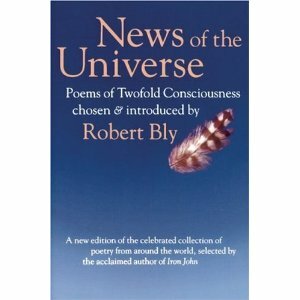 He edited and introduced the poetry anthology News of the Universe: Poems of Twofold Consciousness in 1980, ten years before Iron John. In the anthology, he includes poems "in which the human consciousness, though present, becomes transparent." He includes poems about the "struggle to open the consciousness-door" and poems that "suggest a certain unity of consciousness that we haven't arrived at yet," that older cultures expressed in poetry "a deeper union than the post-Industrial Revolution psyche has yet achieved." I guess this is why I practice the Transcendental Meditation technique and why so many of us are seeking knowledge of who we are. By finding the Self, that which is beyond duality, neither man or woman but the essence of both, we can then step onto the platform that our body and life's work give us and act--as a man, a wo-man, or a hu-man. We are who we are, and may God bless us with self-knowledge and happiness.